Working with Plan Sponsors to identify and implement the appropriate funding strategy begins with understanding risk tolerance and projecting cash flow management. For many organizations this may result in procuring a fully insured plan. Many of our fully insured plans utilize Risk Participation Agreements (RPA) (commonly referred to as Contingent Premium contracts) to recover premium dollars following better than expected claims experience, with minimal risk for poor experience periods. For other Plan Sponsors, the appropriate funding strategy may result in establishment of a partially self-funded plan. As part of our annual renewal processes, Bim Group works to analyze the appropriate funding strategy based on the underlying risks of the population, market conditions, and client business objectives. Benchmarking is the foundation of informed and objective decisions. Bim Group compares our clients’ health care plans based on their industry, number of employees, and region of the country and state to the UBA Heath Plan Survey, a national annual analysis of health plan data from approximately 11,000 employers sponsoring 19,500 plus plans. Comparing this data with our clients’ data regarding average gross premiums, employee payroll deductions, employer contributions and benefit structure helps our clients adjust and position their plans to achieve maximum value. Additionally, Bim Group actively participates in the Aegis Stop Loss Premium Survey, enabling us to benchmark reinsurance premiums based on contract terms, deductibles and premiums. Our dedicated underwriting and analytics team provides monthly financial plan reporting, clinical claim analysis, plan modeling, benchmarking, budget development, and renewal projections. Our analytics team has extensive experience collaborating with a carrier’s actuarial and underwriting staff, analyzing multiple plan designs, and navigating the reporting intricacies of union and non-union environments. Bim Group’s consultative approach in managing clients’ financial exposure uses predictive modeling software and risk mitigation strategies. Using actuarial software to model and normalize benefit design changes, combined with actual claim utilization re-pricing exercises, we are able to identify cost savings opportunities for our clients. Not only are we able to gain pronounced clarity into the impact of alternative benefit strategies on plan cost, we are able to identify rising risks that can be managed through intervention strategies, which support member level preventive care and chronic disease-prevention initiatives. In-depth analysis of all current employee benefits and financing arrangements, including purchase and collectively bargained agreements. Thorough review of self-funded plans that may involve reinsurance contracts, terminal liability clauses, IBNR and other accrued liabilities. Development of prospective pro-forma budget projections. Health and welfare compliance audit to determine any prior deficiencies. 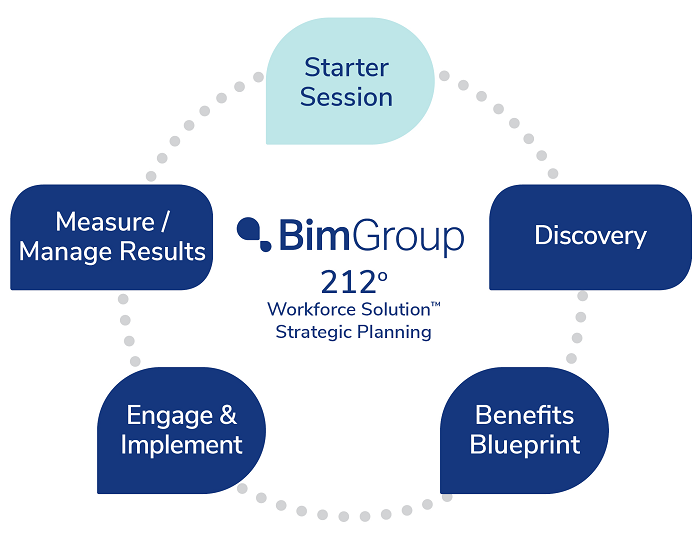 Bim Group recognizes that global work opportunities present novel challenges in creating benefit plans to accommodate employees spanning multiple countries. Our expertise in this distinct challenge can help establish a scalable global benefits strategy that provides international employees with the same positive benefits experience as US-based employees. Bim Group provides access to aggregated purchasing coalitions to dramatically improve Pharmacy Benefit Management (PBM) contractual pricing guarantees for clients utilizing self-funded plans. Additional pharmacy rebates in excess of those quoted in standard proposals are often overlooked in negotiations, but yield substantial cost recovery opportunities. While the financial guarantees of a PBM contract are paramount, considering the potential negative impact on members is equally important in managing pharmacy benefits for self-funded plan sponsors (e.g., narrowed formulary, clinical programs, etc.). Risk mitigation can take multiple forms, including but not limited to funding approach, contractual guarantees, frequency and type of large claimant utilization, etc. We work with our clients to identify industry leading contracts (e.g., Stop Loss/Reinsurance contracts) that reduce the risk of ongoing or unforeseen catastrophic claims to help maintain budget integrity. For many clients, this may also include implementation of Population Health Management programs to support early identification of potential large claimants, or helping to direct members to appropriate places of service for care based on outcomes and cost. Using our standards-based management system to conduct the Request for Proposals (RFPs) process for clients ensures tactical execution of both the immediate annual renewal process, as well as multi-year strategic initiatives. We maintain relationships with all major carriers in the marketplace to support client RFPs. Through our proprietary online procurement platform (IBX), we leverage reverse auction technology to drive increasing competition within the carrier community for the benefit of the employer group, while ensuring contractual and administrative provisions are met. Through our three-step process of technical evaluation, financial evaluation, and vendor evaluation, we achieve substantial savings for reinsurance, dental and life/disability contracts.